I’m always looking for little holiday goodies to make as it’s what I grew up doing with my mom. It wasn’t just about the cinnamon rolls, sticky buns and banana cream pies at our house, no it was also about truffles and candies! 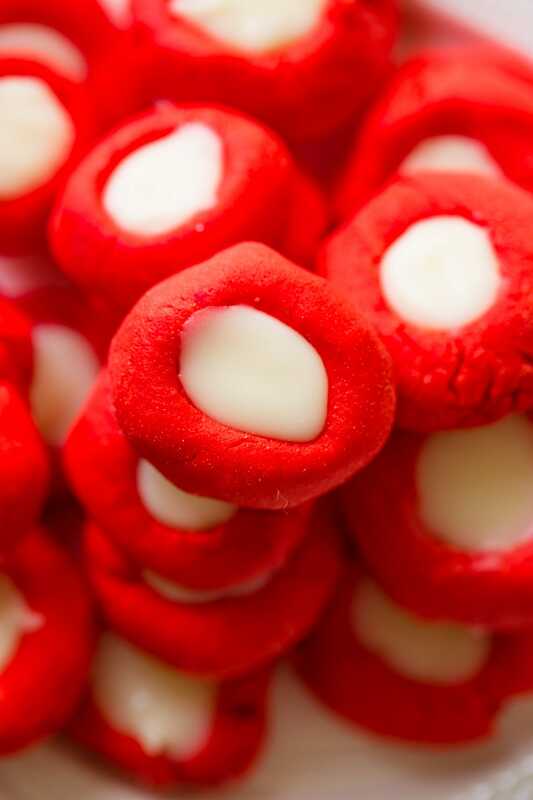 These peppermint cream cheese mints melt in your mouth and the cool peppermint with a white chocolate ganache. 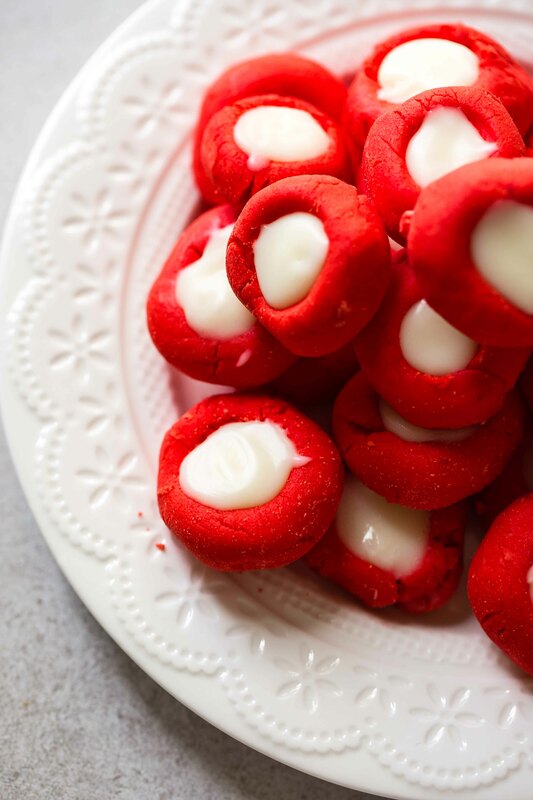 Cream cheese mints are one of the easiest candies to make. Absolutely no thermometer or pacing in front of a stove of sugar needed, just cream cheese, peppermint extract and powdered sugar! 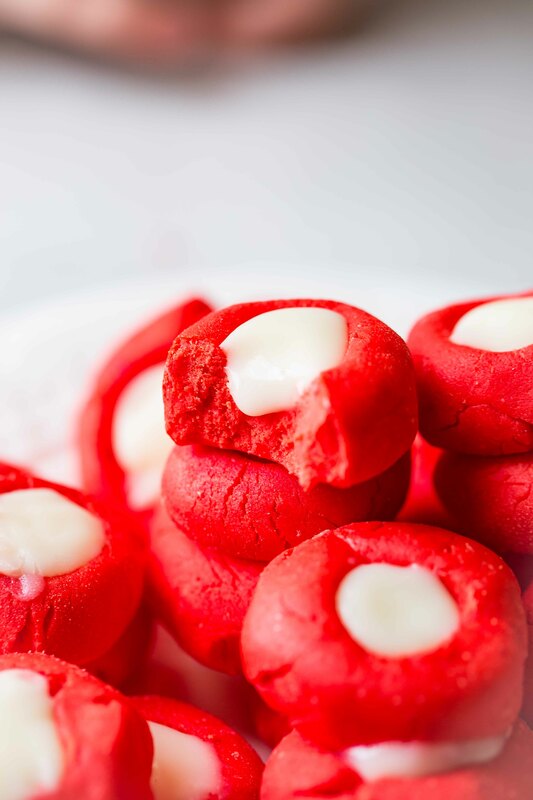 In this case we added red food coloring and a quick white chocolate ganache into the center to make them a little more festive for Christmas. Ganache is just chocolate and heavy cream, though you can use half and half in a pinch. I would know as this very picture has a half and half ganache. I do think that ganache holds up better and a little more thick if you use heavy cream, so try to stick with that. To make white chocolate peppermint cream cheese mints just make sure you start out with softened cream cheese. Cold cream cheese can lead to lumpy mints. Beat your cream cheese until smooth and then add powdered sugar, only about a cup at a time. This process can be a little confusing as the more powdered sugar you add the more separated everything becomes, but just keep going. After the first batch of powdered sugar, add your extract and food coloring. Beat again and then at the end go ahead and knead with your hands to combine into a smooth dough. If your dough is soft and holding together when you roll into a ball you can stop adding powdered sugar, sometimes we leave out up to 1 whole cup but you just have to watch it. We tested and tested and ours came out perfect with this amount so you should be good to go, but if it starts to look dry and crumbly when you squeeze some together in your hand just don’t be afraid to stop adding powdered sugar. Ganache is crazy easy to make, but you heat the ingredient some people are not expecting. Heat the cream in a saucepan or in the microwave until foamy but not boiling. Pour over shaved or chopped chocolate (or chocolate chips) and stir until smooth. Let cool and place in a ziploc bag. Once you’ve rolled the “dough” into balls on a parchment lined baking sheet, or we prefer this cheap Silpat since it’s reusable and easy to clean, just refrigerate the mints for one hour to set. Meanwhile, the ganache should be cooled so you’re just waiting for the mints. Once the mints have set up just pipe the ganache into the centers and store in a single layer in the fridge until serving! 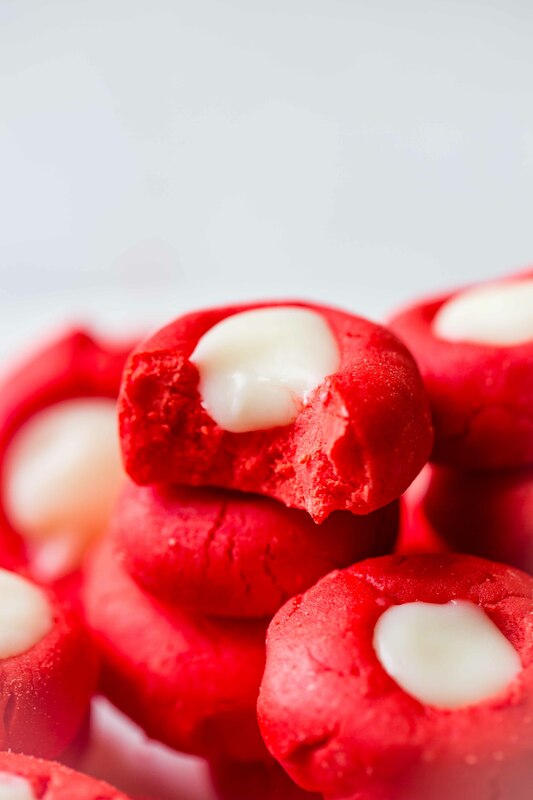 There's something so melt in your mouth good about cream cheese mints, so turn them into white chocolate peppermint cream cheese mints for the holidays! Combine the softened cream cheese and one cup of powdered sugar in a large bowl and use a hand mixer to combine. Add the peppermint extract and red food gel, mixing again to combine. Slowly add the rest of the powdered sugar and mix until combined, using your hands to really work everything together in the end. 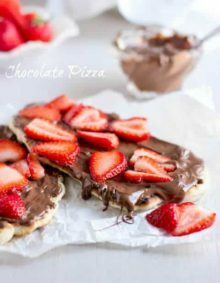 Place parchment paper or a silpat on a baking sheet and begin to roll out 1 teaspoon full of dough in the palm of your hands. Repeat until everything is done. Use a 1/4 Teaspoon to press an indentation into the center of the dough. Place chocolate chips or white chocolate shavings in a glass bowl. 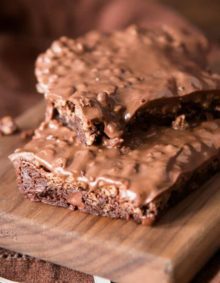 Bring heaving whipping cream just to a simmer with foam around the edges, and then pour over the top of the chocolate chips. Stir a few times to combine and then let sit for a couple of minutes. Transfer the ganache to a ziploc bag and let it cool for 30 minutes or so until it has thickened up. Snip the end off of the bag, a small snip and pipe the ganache into each mint's well. Chill for 1 hour and store all leftovers in the fridge. 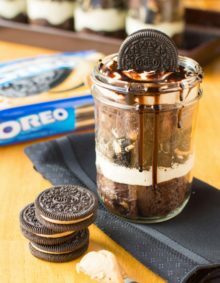 Looking for an easy 2 ingredient holiday treat? 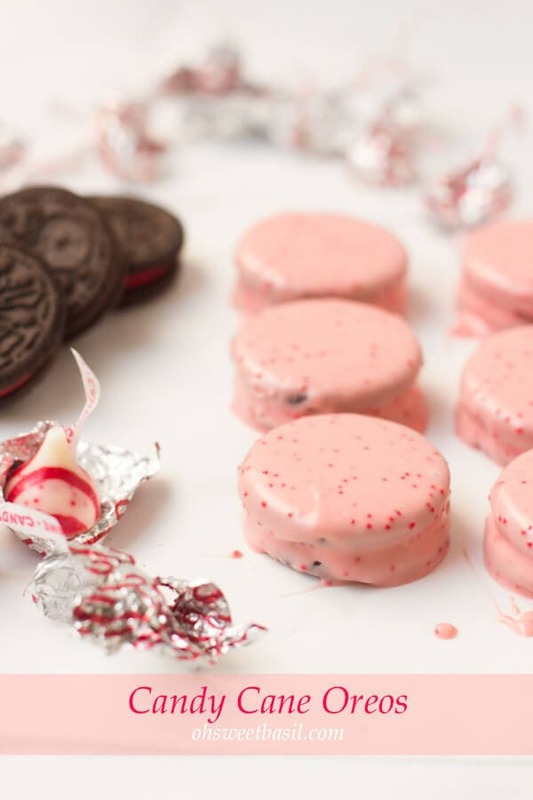 These candy cane oreos are perfect! !